Lydia has decorated their room with a variety of blues and greens, so I decided to stick with that color theme, assigning each boy a color. 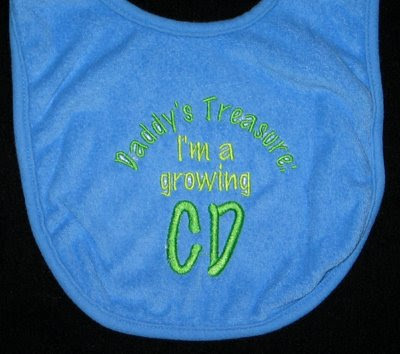 Eliot has primarily green items, and Chet has primarily blue. 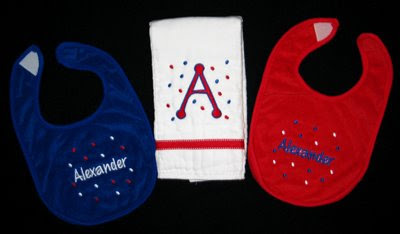 Next are their burp cloths. 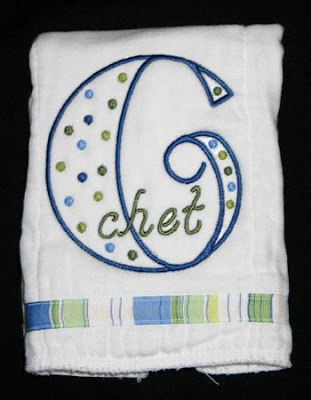 The monograms are from the Dot Alphabet I originally got on Sew Forum (now available at Julia's Needle Designs), and the names were added with Five Star Font's Whimsy Alphabet. 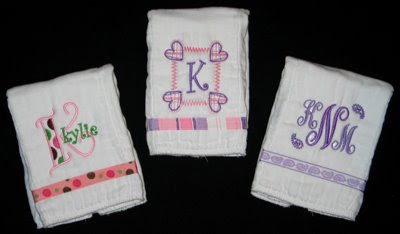 I have used this monogram set for all eight of the new babies at church! 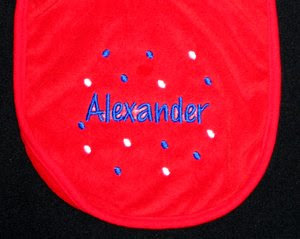 Finally, I don't do it often, but I attempted to be a little witty with their initials on these designs for the bibs. I used Embird Alphabet #8. Here are a few orders I have completed over the last few weeks. 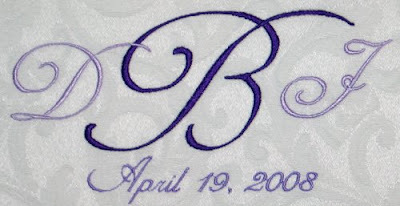 The big monogram is from the Tinker Toy font that was originally posted on SewForum, now available on sewcrazie's yahoo group. His name was added with Embird Alphabet #8. 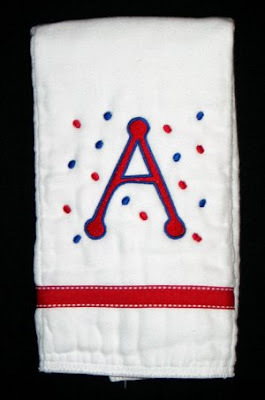 And finally Jaime ordered a burp cloth for her neice. 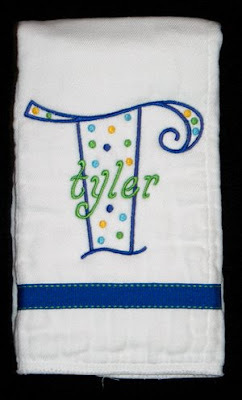 The monogram is from the Dot Alphabet I originally got on Sew Forum (now available at Julia's Needle Designs), and the names were added with Five Star Font's Whimsy Alphabet. Then Sue took it home and completed the pillow! I enjoy projects like this. 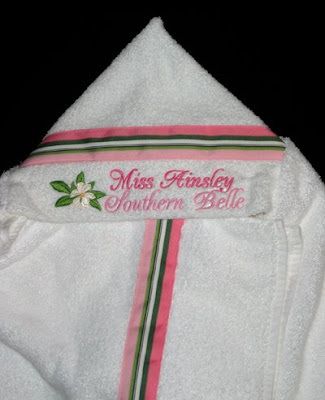 Many of my friends have excellent sewing skills, but don't have an embroidery machine. 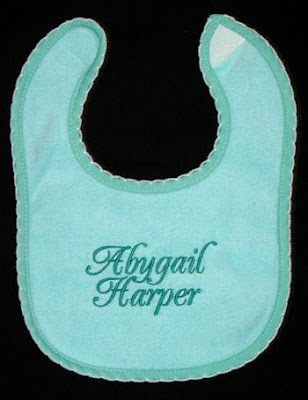 It's nice to be able to help them make personalized items. 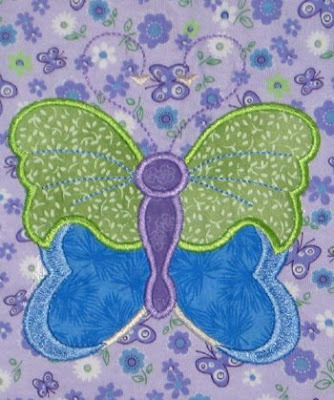 I've done monograms for Sarah who makes bags, soon I'll be stitching text on fabric for Michele who is making throw pillows, and just today someone asked me about embroidering Bible verses for a quilt she wants to make. 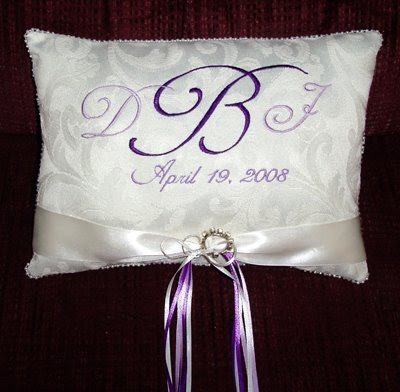 I'd say the best feedback from a gift is when the recipient orders more! 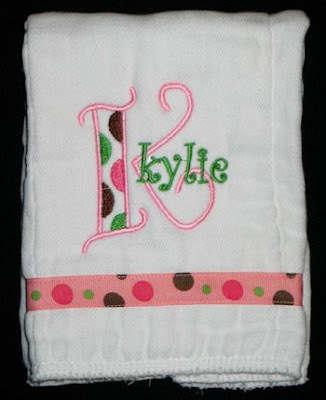 Eureka has enjoyed the original burp cloths that I made for Kylie, and ordered three more. 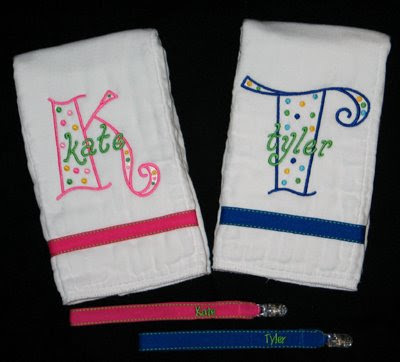 She let me design them myself, just requesting one with her name and one with a three-letter monogram. I had lots of fun coming up with them! 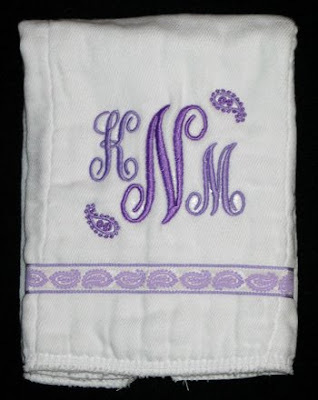 The first burp cloth has a stacked monogram. 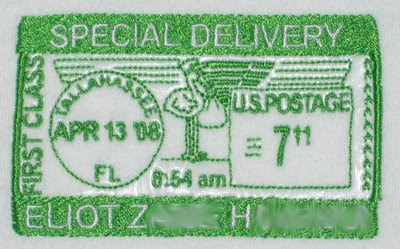 The "K" is from Five Star Font's Whimsy Dot. I added her name with Embird Alphabet #17. The second uses a frame I bought last summer but haven't stitched out yet! I love the way it looks with this ribbon. 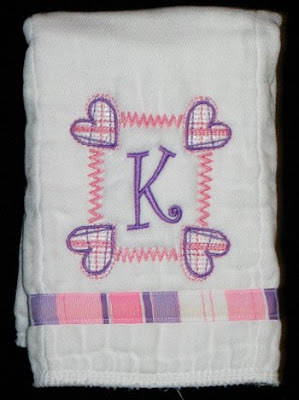 The frame is from AK Designs Boutique, and I added the K with Embird Alphabet #17. 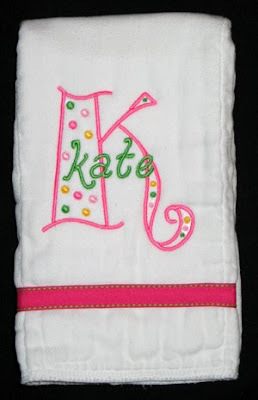 For the third design I used Monogram KK font from Sew Crazie Designs. The paisley accents are from a different frame from AK Designs Boutique. Tiffany's boss and his wife are expecting a son. 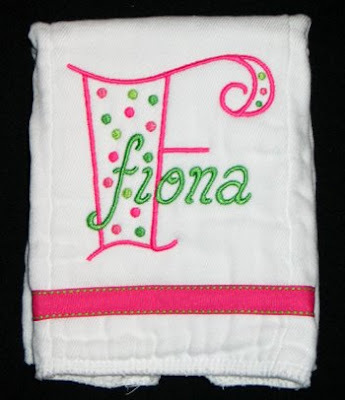 A baby shower in their honor was yesterday, so Tiffany requested a gift set. 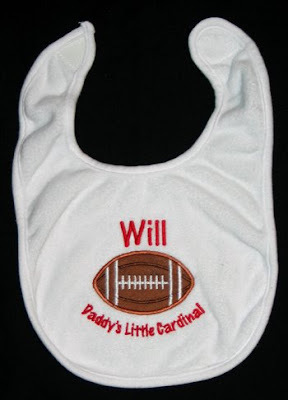 Dad is a sports writer and played football for Ball State; mom is an FSU grad. 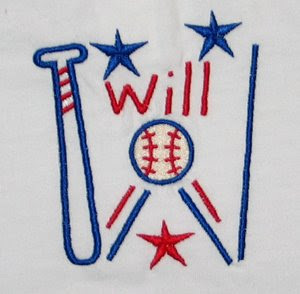 The shirt design is from Five Star Font's Baseball Monogram. 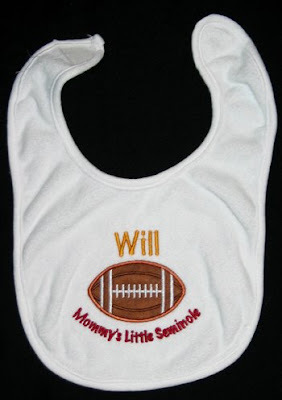 For the bibs, the applique is actually a football sucker holder design from Embroidery Garden (a freebie on her yahoo group), and I added the text with Embird Alphabet #8. Helping Jason & Anna announce their BIG NEWS! 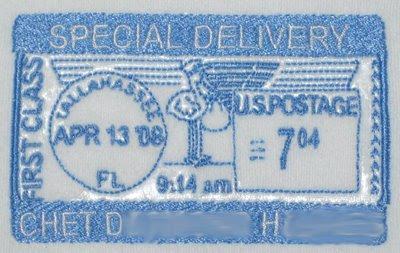 Mid-March I got an email from my good friend Anna. She said she and Jason wanted to commission me for a project, and that they wanted to Skype (talk via webcam) to give me the details. She was curious how busy I was and said there was no rush. Even with that statement, I got pretty suspicious as to what would be so important they would want to see my face instead of talking on the phone, but I kept my thoughts to myself. The evening of Easter Sunday we finally connected, and I was the first to learn their secret news -- they are expecting their first child!!! They wanted me to help deliver the news to their family. 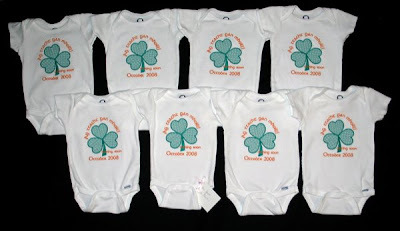 They had design ideas in mind to stitch out on onesies and mail to parents, siblings and grandparents. 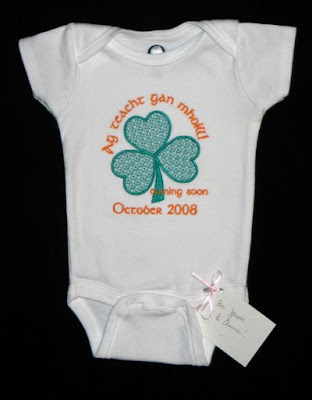 Because of his Irish heritage, Jason wanted to use some Gaelic text. We worked for a few days to finalize the overall design, and then I got to stitching! 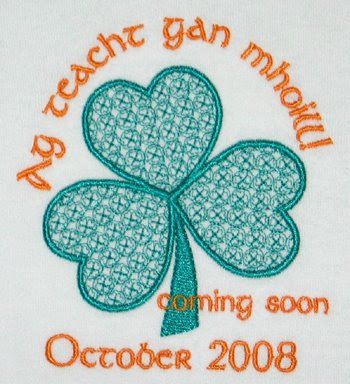 Jason had already picked the Gaelic phrase "Ag teacht gan mhoill" which means "coming soon". We used Embird Alphabet #37 which has a nice Celtic look to it. Jason also found the beautiful shamrock at Stitchery Mall. They picked the thread colors to follow Ireland's flag. 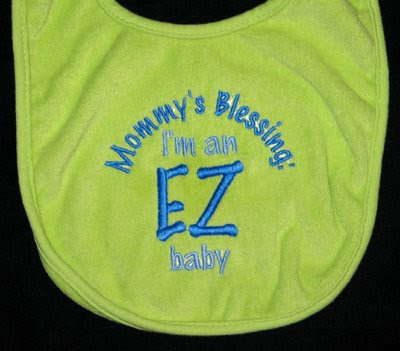 I thought it also made a very gender-neutral design! This is the biggest design I have put on a onesie thus far. Since it took 30 minutes to stitch out, and I had to do it eight times, I decided after the first one to open a side seam to make it easier to hoop. That was a good choice. Even though it took more time to rip a seam open and re-stitch it, it meant I didn't have to hold each onesie open for the 30 minutes it stitched out. I still had to babysit my machine, but could do some work on my laptop at the same time. This was such a fun project. 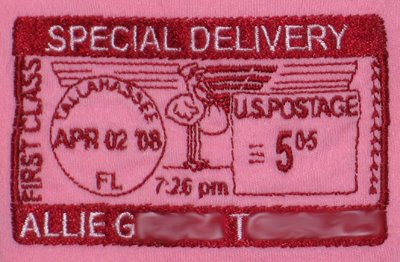 I rushed to get it completed, and by the next Sunday evening they were packaged up. 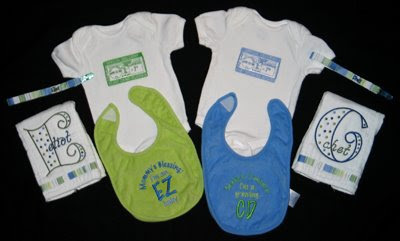 I shipped them off to Jason and Anna, who re-shipped them to family upon arrival. 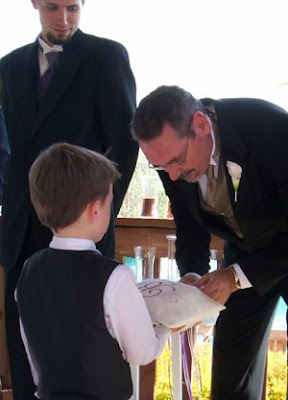 Now their family knows and they have shared their news with other close friends. It's finally public knowledge and I can share my tiny part in their new adventure!! So CONGRATULATIONS Jason and Anna! 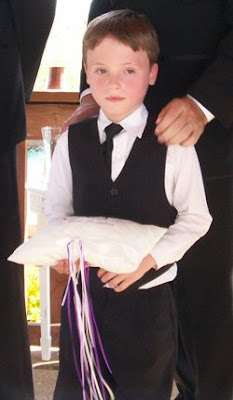 I'm sad that I can't be there to congratulate you in person and watch your family grow. But thanks for entrusting me with your secret. It was an honor! 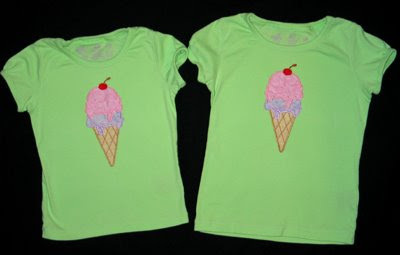 In addition to the matching ice cream cone shirts, I did another shirt for Kylie's birthday gift. 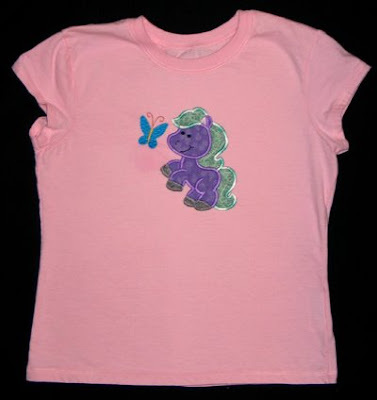 The pony came from Design by JuJu's Pretty Pony Applique set. 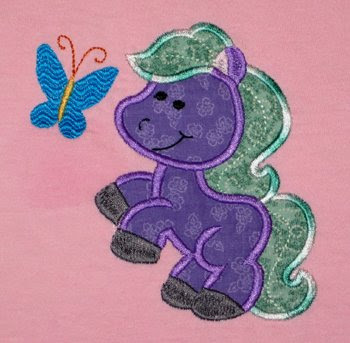 Julie has used variegated thread in several of her stichouts, and I decided to do the same on this pony's hair. I like the effect! 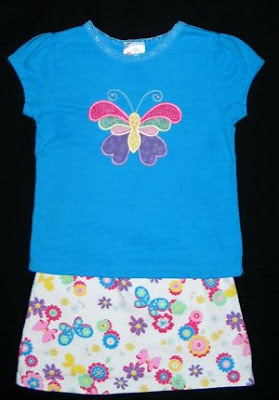 After stitching the pineapple shirt and the flower/butterfly dress, I did one more shirt for Annaliese's birthday present. And the proud girl, who is finally giving me a cheesy grin again instead of a forced fake smile! Scoop Yourself Up Off the Floor, Annaliese Has Just Turned FOUR! 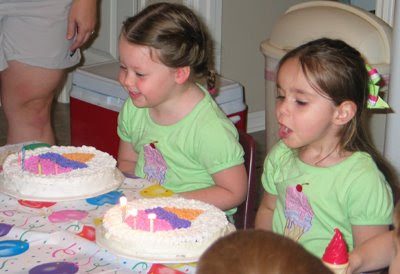 Thursday was Annaliese's fourth birthday, and her best buddy Kylie turned five the day before her. Valerie and I decided to throw a joint party this year since many of their friends overlap, and that was held this afternoon. 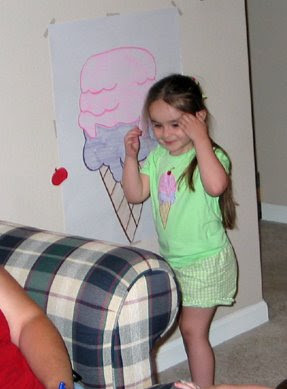 We decided not to go with a character-based party and instead picked an ice cream theme. Carlin put together a great invitation for us. Valerie researched party games, recipes and bargain shopping. 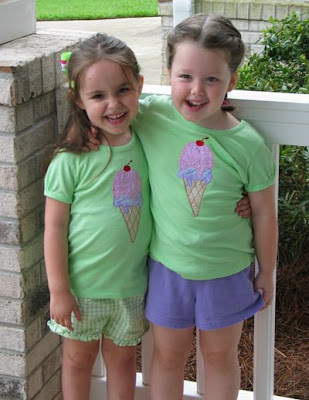 My goal was to make them matching shirts! 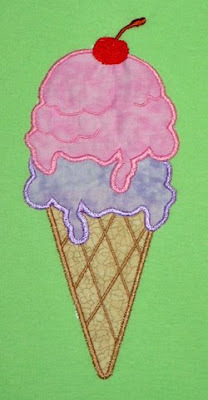 I found this adorable ice cream cone applique from Sew Terific. Actually it was originally a one scoop cone, but I modified the design to make it a two-scoop. Despite rain that kept us indoors, things went well and it was a fun party! 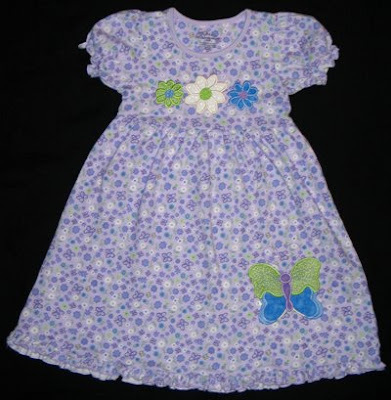 Making a cute dress cuter! 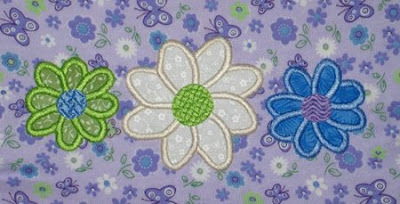 The flowers on the bodice are from the Bloomin' Applique set from Designs by JuJu. I separated the daisies from their leaves and rearranged them to make it fit my space. 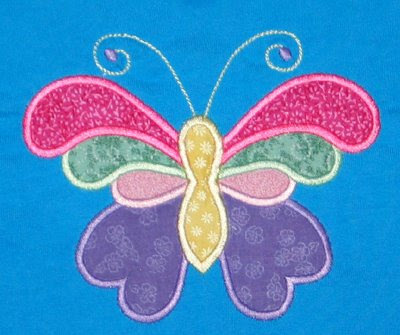 The butterfly is also from Designs by JuJu, her Fun Spring Butterflies Applique. Annaliese was dying to try it on before I even removed my marking lines! 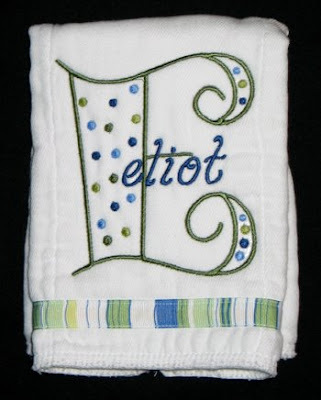 The magnolia is from Embroidery Library and the text was added with Embird Alphabet #38. 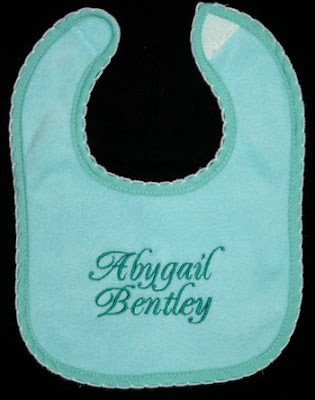 Two days later, as Tiffany was checking their family blog for pictures, she discovered that Abygail's middle name was not what she had been told! 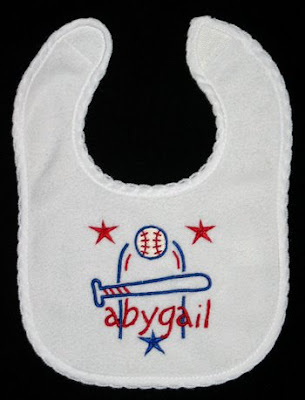 She called to see if I had stitched the bib yet. I was not home, but Carlin confirmed that I had. When I talked to her a bit later she told me not to worry about it - it would be a fun gift they would all laugh about. 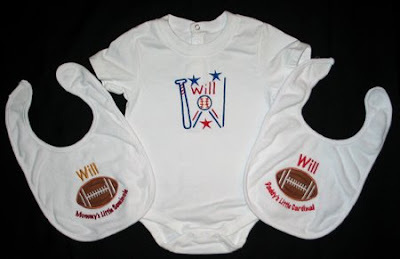 Kristen ordered this cute set for a friend that recently had boy/girl twins. 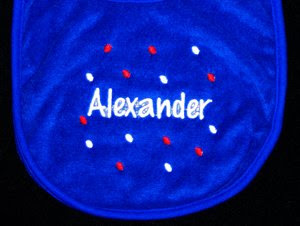 The monograms are from the Dot Alphabet I originally got on Sew Forum (now available at Julia's Needle Designs), and the names were added with Five Star Font's Whimsy Alphabet. Opening Day was a Success!